Not much to report. Character summaries are complete, and I’ve gone as far as I can with the novel blueprint (I don’t plan out everything that happens; I like to be surprised, too, and I’m desperately clinging to that little bit of my pantsing tendencies. ;-)). So hey, if any indie author is willing to give my upcoming not-quite-urban-fantasy release a read and a review that I can stick in the front, I’ll love you forever and return the favor however you need. It’s just shy of 23,000 words. 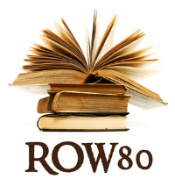 Hop on over to the #ROW80 blog hop and see how the others are doing!